San Andreas is a film made with the utmost commitment to artistic vision. It is the work of a director fully invested in the task at hand, and confident enough to never waver from the mission. Director Brad Peyton knows what he wants and explores every opportunity to get it in on screen as often as possible. And if there’s time, some nifty earthquake effects. 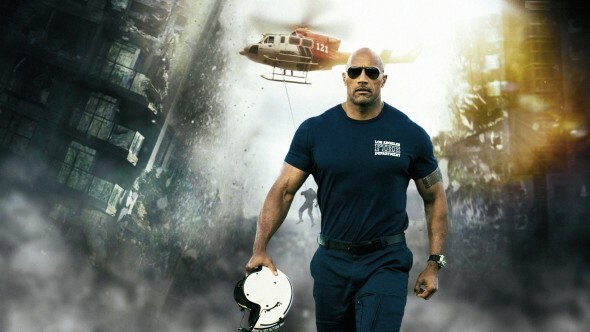 He gets both, along with the gun show that is Dwayne Johnson starring as Ray Gaines, an LA firefighter who specializes in helicopter rescue. Ray’s already dealing with his daughter Blake’s (Alexandra Daddario) plan to move away, when he learns his soon-to-be ex-wife Emma (Carla Gugino) is moving in with her uber-rich, ultra douchy new boyfriend Daniel (Ioan Ruffud). So Ray’s feeling blue, and as he drives away from Emma we see her framed squarely in his rear view mirror. That’s the level of subtlety you can expect from San Andreas: zero. The quake is presented in often spectacular fashion, and the effect it has on the buttons of Gugino’s blouse is not ignored, either. Of course, that’s only after she’s spent the required amount of time running in a super tight tank top. From the opening (and admittedly effective) sequence showing a young girl rescued from a wrecked car, straight through to the rubble-strewn, flag waving finale, nearly every female with a speaking role (and Daddario especially) wears a tight, often wet shirt while being framed at an angle high enough for optimal oogling. Sure, the tight tank is old hat for PG-13 jollies, but even Michael Bay might find this excessive. Johnson has become a charismatic star, Gugino is always a treat, and the film should get some credit for actually pairing two age-appropriate leads. Paul Giamatti even shows up as a seismologist, but that ultimately just solidifies the point that no amount of acting talent can raise San Andreas much above the mindless threshold of blowing stuff up and catcalling the babes.